What is the most common conundrum for an app developer or for any outsourcing partner? It’s how efficaciously they can provide a solution to their clients, keeping all the resources at hand and that too in constraint. The focal point of every project is to deliver the best solution keeping all the other three variables in control. 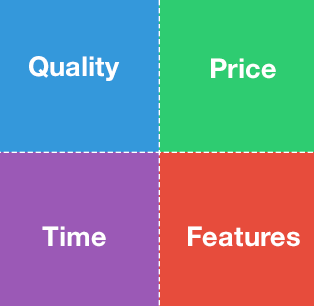 These three variables include Price, Time and Features. But this is where the theory of marginal utility comes into play. Let’s break this dilemma with the help of a clone which will include the basic quadrant which can best describe the customer’s expectations. https://www.dexconsulting.com/wp-content/uploads/2015/02/ON-NOW-1.png 397 636 Satayender https://www.dexconsulting.com/wp-content/uploads/2017/10/dex-logo-300x138.png Satayender2015-02-26 08:57:112015-02-26 09:11:24An app developer’s bane!!! In this day and age, there is no shortage of ways to advertise and improve your brand image. Sure, there is the traditional media of web based advertisements, radio plugs, and TV ads. Of course, if you want to be “IN” with the latest trend, the first thing you should consider are mobile apps. Yes, Mobile apps are basically the biggest attention grabber of the century. While most will not like to admit it, our lives are increasingly centered and dependent on our mobile devices, and within these mobile devices are apps. According to the Flurry Five-Year Report: It’s an App World. The Web Just Lives in It, people spend an average of over 2 hours a day using apps on a smart phone. The most important bit here is that people tend to use these mobile apps during opportunistic times for an advertiser – during meals, while shopping, on the way to work, and just about every idle moment that a person can have in a day. Its reach is far more penetrative than the average advertising media. Step 2: New Autobot toy is featured in the TV show. Step 3: Profit from sales of new toy that kids saw on TV. It is the same principle with apps. If you have a new product, like a new toy lineup, a new lineup of clothes, or maybe a new service, why not incorporate it somehow in an App? You can sponsor a development of game that would feature your product. You can even create desktop and keyboard themes that would hint towards your product. There’s also a more direct approach – creating the official app of your brand. This is becoming increasingly popular, especially for brands that have something to sell. They create online shopping apps for their online store, or even create a loyalty program with the use of mobile app, which is something big names like Pizza Hut and McDonald’s are using. Not only do they put their products closer to the reach of the customer, but they also improve their standing thanks to how well the app worked and through their app based promotions. Lots of companies are starting to migrate their business closer to mobile apps just like the proliferation of App based Taxi services and app based online shopping and book reading. It is very clear that if you want to have better brand image, recognition, and penetration, then you better start investing in a good app developer. Mobile technology has played a major role in transcending boundaries in technological advancement. As year passed by, more opportunities are offered by mobile technology in the area of consumerism, GPS, online experience, and gaming. Business and companies have utilized these to market their services and products to better their advertisement and increase their revenue. Here are four reasons to go mobile for your business. 1) Most people have smartphones and access to the Internet. 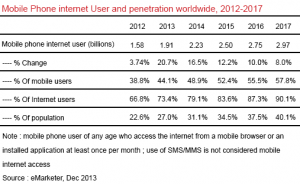 According to eMarketer, 4.55 billion people all over the world will be using a mobile phone in 2014. Furthermore, between 2013 and 2017, an increase of 61.1% to 69.4% of the global population will be seen on mobile phone usage. 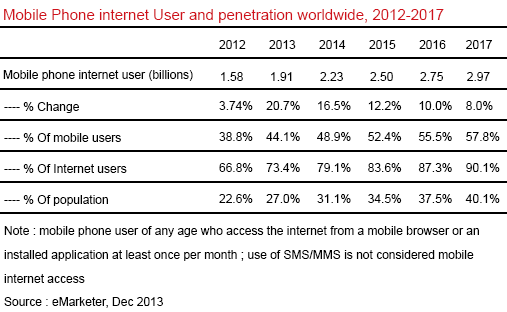 eMarketer also estimate that the total number of mobile phone internet users will rise 16.5% in 2014 and maintain double-digit growth through 2016. 2) Another form of advertisement and marketing method. Mobile applications have been one of the innovative inventions in today’s history. Almost 70% of the world’s population has smartphones, and access to the Internet has never been easy via the Wi-Fi technology. These factors led to mobile applications as a form of advertisement and marketing method. Consumers spend more time on their smartphones rather than on their computers. Most features of the computer are also incorporated into smartphones, with smartphones having unique features of its own. Businesses and establishments who go mobile are likely to increase their return of investment and annual profit. Apple Inc. launched the iBeacon technology which it calls “a new class of low-powered, low-cost transmitters that can notify nearby iOS 7 devices of their presence.” iBeacon helps smartphones and other iOS 7 devices show notifications of items and services that are on sale, and it can be used to make payments for purchased goods. This technology offers the mobile enterprise an ample amount of opportunities to explore and grow. 3) Increase brand perception by target audience. Most searches people made are connected to finding businesses and establishments such as restaurants, hotels, and clubs. Restaurants have outstanding 90% search-related transactions with 64% converting within one hour according to moralmobile.com. 4) Provides information to target audience and potential customers. TV commercials are expensive especially to new businesses and establishments. Alternatives such as flyers and posters are not enough to disseminate information such as promos and sales from your businesses and establishments. The introduction of mobile technology offers low-cost advertisement that is easily accessible to your customers. Customers will be able to see information such as locations, operating hours, promos, sales, products from your business. Online payment is also a privilege most customers want to have, avoiding the hassle of waiting over long lines. Whether it is a mobile application or mobile website, going mobile present opportunities for your businesses and establishments to expand its territories and market its products and services to other potential customers.